The foundation of Braahmanyam, the essence of being a Braahmanan, is Sandhyaavandanam, the observance of ritualistic prayers at critical points of the day. All Braahmanans not only must need wear the sacred thread (Poonool) but also observe the appropriate rites of Sandhyaavandanam. Hence, we have specifically incorporated in "namboothiri.com" a few articles that provide self-evident information (including the Manthrams) for the readers regarding the ritual. The three Vedic branches of Rik, Yajus and Saamam that are prevalent among Kerala Braahmanans comprise five chapters of Aashwalaayanam, Kausheethakam, Baudhaayanam, Baadhoolakam, and Jaimineeyam, and these chapters vary slightly in their practices of the rituals. The articles here try to deal with these differences as well so that they give relevant guidelines to all sections of Namboothiris to adapt the principles and practices suitably to their own set of beliefs and traditions. The argument that it is pointless chanting Manthrams without understanding what they mean is untenable, and conscious application and operationalisation will invariably lead on to positive outcomes. Knowing what they mean will, quite possibly be an added bonus. In addition, few articles also deal with some special rituals prevalent among Kerala. Maadhyandina-sandhyaavandanam (also known as upastthaanam among Nampoothiris), the rituals for renewal of sacred threads, praanaagnihothram (also known as bhojanavidhi, or ways of ingestion). Before Sandhyaavandanam, it is essential to observe bodily ablutions like shaucham, aachamanam, snaanam and internal ablutions like prokshanam, manthraavagaaham, jalapraasanam, etc. By Aachamanam it is intended the cleansing of the indriyams, loosely translatable as "sense organs". Aachamanam, of which there are three types, is a pre-requisite to the cleansing of the mind and thoughts. The three types are: srautham, smaartham and pauraanikam, and, the last of which is usually what is ordained as well as traditionally observed by Keralites for the diurnal junctures or sandhyaas. The hair must be styled into a lock (Sikha) (click). Those without long hair must ensure that a few strands of hair must be twisted together to replicate a lock of hair. Clothing should either be a loin cloth or the "dhothi" trussed up in traditional braahminical fashion of "thattudukkal". Hands and feet should be duly washed. One must face the east or north or optionally any body of (fresh) water. When at a body of water like a pool or lake, observe the following posture: Squat with one foot in the water and the other ashore; bring your arms between the two knees; dip your left hand in the water (if at a faucet, hold the left hand under it) and perform the aachamanam with the right hand. Take a drop of water in your right palm and ingest it three times. Take care to wet your hand before each of the following steps: Wipe across from right ear to left ear twice as two actions. Wipe from forehead downwards to chin. With a drop of water held between the ring finger and thumb touch the right eye and repeat for the left eye. With a drop of water between the thumb and index finger touch the right side and then repeat for the left side of the nose. A drop of water between the thumb and the little finger and touch the right ear base and then repeat for the left ear base. Finally, touch the heart, and then the head with all fingers except the little finger, moistened. This makes one aachamanam. To complete the ritual, repeat the whole process all over again. Wherever it says "wash your feet and do aachamanam" remember that the ritual is complete only with the duplication. Aachamanam is followed by prokshanam, which is internal cleansing with Manthrams and dedication. For Rigvedis and Saamavedis, there are three Manthrams to be recited, but for the Yajurvedis, there are four, the fourth one being the surabhi, recited initially. Take water in your hand and after reciting each Manthram, sprinkle the water on your face first and, finally just before coming out of the water, on your head. The spiritual aspiration is that any body of water sanctifies itself once a Braahmanan performs his routine Manthrasnaanam in it. Perform two repetitive aachamanams each with separate preparatory moves. Once with the sacred thread wound round the right ear – ritual initial ablutions done – the duly cleaned loin cloth put on and the sacred thread put across from right shoulder to left loin (Valathidal). Again with the hair washed and tucked away into a lock, perform a third aachamanam after taking a dip in the water, scrubbing clean one's body, taking two to three more dips, and coming ashore. After the above, recite the Manthrams of prokshanam, sprinkle some water on the head, re-enter the water, take another dip invoking the river Ganges into the body of water you are in, and come ashore. While in waist deep water, reciting teertthaavaahana manthram (below) is also highly recommended. [Oh, the sacred rivers of Ganga, Yamuna, Godaavari, Saraswathi, Narmada, Sindhu and Kaveri! Please sanctify this body of water by your presence!] (Translation by P.B.N.). It is important that the entire body along with all the habiliments are completely immersed. When coming out of the water, sprinkle two fistful of water on the shore step to cleanse the step. Out of the water, first wipe your back. Clean the towel and then wipe the face and head. After that, style your hair into a lock, wash your feet and perform an aachamanam. Then wipe your body, fold your towel into a loin cloth to replace the one you are wearing. Remember to undo your loin cloth from behind forwards. Wash hands and feet, sit down and do another aachamanam. Chant the pranavam and make a forehead thilakam with water. Sprinkle water on your face after chanting manthrams of prokshanam. If the time of day warrants a sandhyaavandanam, an arghyadaanam is recommended. But those prone to jalapraasanam, must wash their feet, perform aachamanam and punah-prokshanam before getting on to it. At other times, one can come ashore after doing tharpanam (see below for tharpanam ritual), and wringing one's clothes dry. Jalapraasanam is recommended after the bath and the performance of aachamanam and prokshanam. It is ordained as a penitence ritual for any sinful acts one may have committed, in thought or deed, knowingly or unknowingly. While some people do this routinely, it does not appear to be universally popular among all sects in Kerala. One need to do this as advised by one's preceptor. Sit down. Take water in the right hand crooked to hold it, recite the Manthram and ingest the water as one would a Brahma theertham. It is important to keep the thumb turned away from the palm not touching the index finger. Some do their Jalapraasanam with just the three "aapohishtthadi" all three times. After the ritual, one is expected to do ritual feet ablutions, aachamanam and then punah: prokshanam. Arghyadaanam can be done only after that. » Not all Rigvedis observe it. » Required for Baudhaayanans among Rigvedis. But quite a few don't observe. » Generally unobserved among Baadhoolakans. However, those from Thamarapilli Desam, perform praasanam with aapohishthtaadi Mantram. » Not generally observed by Saamavedis. » All "outsiders" (Paradesi Braahmanans) regularly observe it. There are many variations among Yajurvedis, an important one of which is given under. Consult your Guru when in doubt. Saucham, washing of feet, Aachamanam, recite the three Riks - "Aapohishtthaadi", and sprinkle, again washing of feet and Aachamanam, then ear to ear wiping of face once each chanting Bhoo: and Bhuva:, next from fore-head to chin chanting Swa: , followed by eyes and other organs. 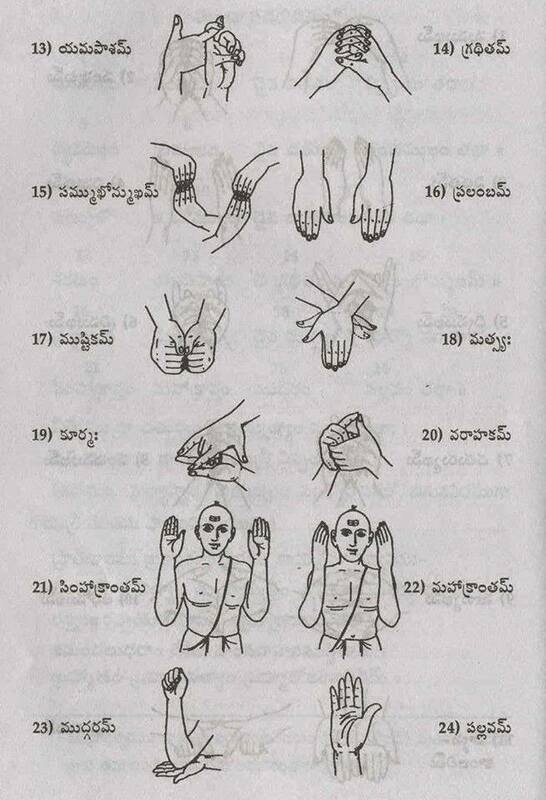 For the second "Thalichukuli" (sprinkle and wash) use both palms and chant the four Riks starting with "Dadhikraavnna…". Arghyadaanam is propitiation of the Sun God. The pradakshinam ("cirumtreading") that goes with it is to be treated as a cosmic gesture. The spiritual aspiration implicit in arghyadaanam and pradakshinam is: Through this act of mine I dedicate and surrender my entire presence to the Sun God "Savithaavu", manifest in the form of Aadithyan; even as that Aadithyan is a manifestation of Brahmaavu, so is my existence. This is also the fundamental credo behind Sandhyaavandanam and hence this spiritual aspiration is a must for all Braahmanans. Once you are through the rites of aachamanam and prokshanam, perform arghyadaanam three times with the sun ahead of you. Face east at dawn and midday, and west at dusk. 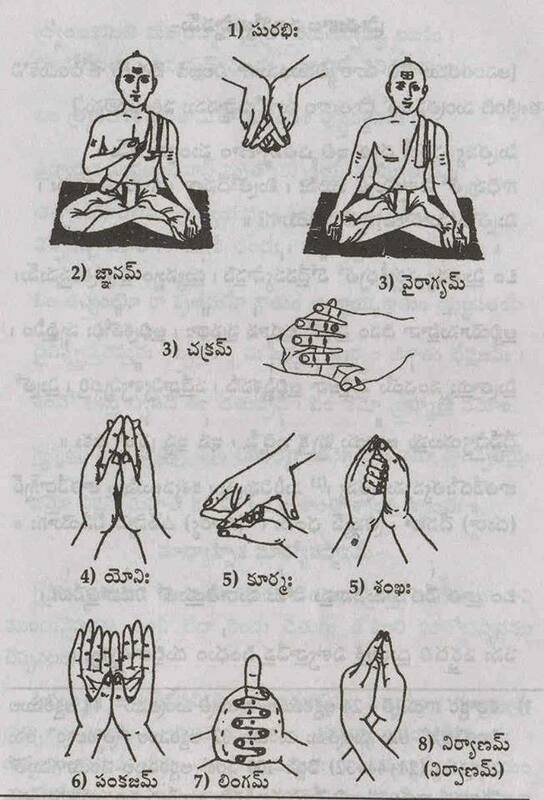 Align feet together: Fixing your mind on Lord Savithaavu, use both hands cupped together for taking water, recite Gaayathri. Remember to keep the thumb away from the palm. Some do it only once and there is a variation among Aashwalaayanans of doing it without the Manthrams too. One should do as advised. At dawn flick the water up from the end of the hand to rise as high as the bull's horns; at noon flick directly up with same manual posture; and at dusk let the water flow down your finger tips like from a conch shell. Aum. Aapo jyothiraso f mritham, brahma bhoorbhuvassuva: aum. After arghyadaanam and aatmapradakshinam, perform tarppanam facing north or east or a body of water, but not facing south. Hold water in palms cupped together and chanting the Manthram perform devatharppnam by letting the water out front eastwards. Like the Jalapraasanam, this is not observed by all, and also has variations in mode. For some Rigvedis: After the three proffers for the forbears, keeping the sacred thread to the left and chanting "swadhaa pithrubyah:", proffer shorewards and to the right in pithru theerttham. 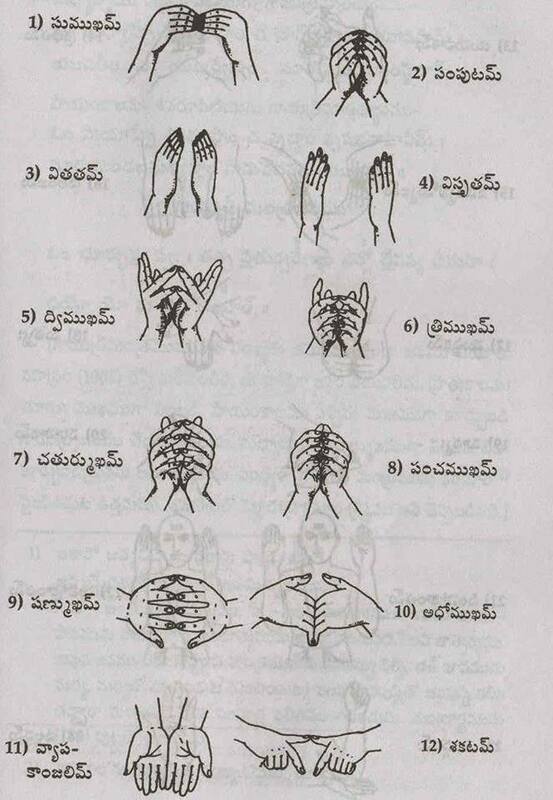 For Yajurvedis: After the six proffers for the forbears, keep the left hand in water, roll the fingers counter clockwise inside the palm and recite the prayers to the water Gods. Proffer three times shorewards: Thrupyatha, Thrupyatha, Thrupyatha. Re-align thread to the right, wash the feet and perform aachamanam. Remember to articulate the long 'rə' in Pithrəən. Deva, Rishi and forbear tharppanams recommended every time after a bath. Only deva tharppanam is recommended when doing sandhyaavandanam without bathing. Three tharppanams are recommended at midday even when performed uncleansed. After tharppanam, one should re-align the thread to the right, wash the feet and do aachamanam. Once one comes ashore having done with arghyadaanam and tharppanam, Japam can begin. Intone sitting facing the west on an “Aavanappalaka” at dusk and standing facing east at dawn. Intone with open palms resting on knees at dusk and open palms folded forward at dawn. Baadhoolakans will intone standing with right palm over left palm and with head slanted to the left. Note: Some Baadhoolakans do nyaasam by chanting “Parameshtthee prajaapathi: rishi:”. Some Bauddhaayanans chant chhandass even to complete the Pranavam. Some who are from family of Thanthris, chant Ashtaaksharam eight times, with chhandass after their Pranavam intoning. After Pranavam, chant Dasapranavam with folded hands (Thozuthu). Bhargo devasya dhee mahi, dhiyo yona: prachodayaal (9) Aum. Aapo jyothiraso mrutham (10) Brahma bhoorbhuva: swa: - Aum. “Gaatthina:” is not required; only “viswaamithra: rishi:”. No change in vocal alternant. 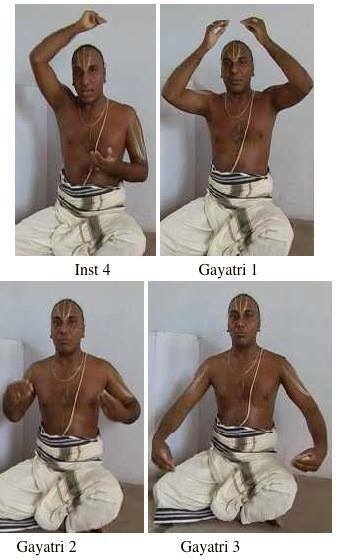 Gaayathri can be chanted in 10, 24, 36, or 108 repetitions. Conclude the Gaayathri with Chhandass. After Punah: pranavam the Kausheethakans chant the following 14 stanzas sitting down with legs folded (chamram padinjirunnu), and palms holding each other (attam pidichu). The Upastthaana manthram is after Punah: pranavam, usually chanted as a prayer, facing the Lord with folded hands. It is proferred to the Sun God Savithaavu, apparent as Aadithyan, who is perceived as Varunan at dusk, Mithran at dawn and Sooryan at midday. Face west at dusk and east at dawn. The Saamavedis pray to the Fire God in the evenings. For Yajurvedis, the Manthram is the same, but there is difference in vocal alternant. 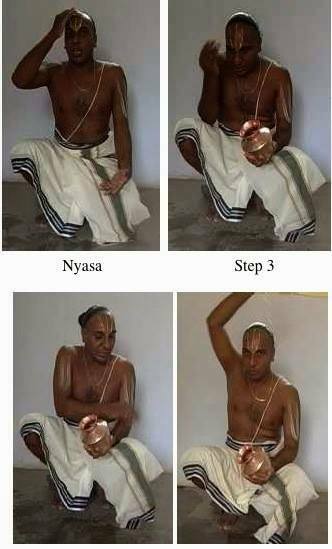 After completing the Upastthaana Manthram, perform the propitiation of the directional bearings. Starting facing east in the mornings and west in the evenings, propitiate the four directions turning clockwise, and finally heavenwards and earthwards. After the directional prayers, do circumtreading seven times clockwise bearing on oneself: Aum. ekam, Aum. dwayam, Aum. thrayam, Aum. chathu:, Aum. pancha, Aum. shull, Aum. saptha. Note: 1. At dusk, start and end facing west. 2. At dawn, start and end facing east. 3. Vyaahrthi is destructive order - (from bottom to top). 4. Pradakshinam is constructive order - (from top to bottom). After the circumtreading, touch the base of the right ear with all finger tips together of the right hand, then chanting “Aum. Dhruvaasi” touch the ground flat handed. Touching the base of the ear with just the thumb and little finger is a variant form, but the ground has to be touched by the whole right palm. Baadhoolakans, however, chant “Dhruvaasi nama:”. Finally perform the ritual greeting. The earth has to be ritually greeted as a representation of the pervasive “purusha” image of the Almighty. Touch the base of the right and left ears with the corresponding hands, fingers held together. Chant the Manthram and bring the hands to the ground, shaping them in the “Swasthika” sign (crossed). The entire palm must touch the ground flat. Twist the right palm so that the little finger, ring finger and middle finger are stretched while first finger is bent inwards forming a hollow in the middle of the palm. The thumb will remain separate from the first finger. The body should be in a vertical position. Now, open the left nostril and inhale slowly. contact with the left hand palm facing skywards. Left hand is kept on the right thigh and then covering it with right palm. Then words conveying our intention is recited as under. This is for Sri Vaishnavas only. Essence of SriVaishnavism is complete surrender to God. Hence every activity is dedicated to the Lord. By reciting these lines, with folded hands, one surrenders his ego and dedicates himself to the service of the Lord, praying at the same time to the Lord (residing as antaryami) to help him in the performance of the act. Say Om and touch the right ear. Stand erect holding tumbler in the left hand between thumb and first finger. Hold both palms together, separating the thumb of the right hand from rest of fingers. Take water in both palms - holding palms at the level of the face. Recite gayathri mantra verbally with sound waves emanating from the mouth; throw the water up in the air, looking at the sun, while doing so the heels of both legs should be raised. (That is arghyam is offered standing on toes). Similar to Arghyam but the heels need not be raised - hold tumbler in the left hand between thumb and first finger. Before commencing gayatri japam some preliminaries such as Pranayamam, sankalpah, pranayamam or pranayamam mantra japam, gayatri aavahanam should be completed. For pratah and madhyanika it is done standing, while for sayam it is done sitting. The japam is done 10, 28, 108 or 1008 times. The counting is done in fingers, with thumb moving to different positions to indicate the number. By using right hand for units and left hand for tens we can count upto 100. The hands for counting should be covered by the upper garment. The hands are held at neck level for pratah, chest level for madhyanika and navel level for sayam. The mantra is in 5 sections, for Sandhyavandanam the first two sections are combined and each of the four sections above should be uttered in one breath. Reciting a few times correctly with words and pauses will be better than reciting several times incorrectly. the same time the mantras. The palms of the hands are kept near ears, the body is bent at waist level and Abhivadanam is recited. abhivaadaye (.........) (..........) (.........) +optionally ( ........) (.........). After completing the recitation, the right forehand crosses above the left forehand, and touch the feet of elders. By Abhivadanam an individual expresses his descent-namely dynastic rishis, gotra, sutra, veda, saka and name.